THE DEAD NEXT DOOR: A Backyard Epic For The Teenage Zombies – Schlockmania! Nowadays, anybody with a consumer-level camera and some editing software can crank out a movie and get it distributed somewhere, even if they just dump it on the internet themselves. However, in the days before online distribution and cheap filmmaking gear, it was a minor miracle when micro-budget filmmakers managed to get wide distribution for their efforts. 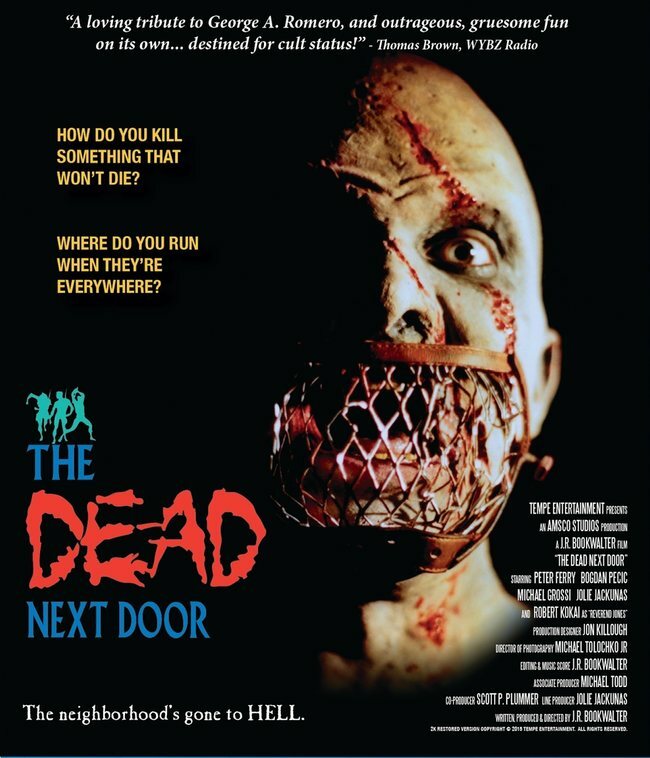 The Dead Next Door is an interesting ’80s-era example of a “backyard epic” that made it into wide distribution, the result of writer/director/producer J.R. Bookwalter persevering for four years to get his 8mm zombie debut completed and released. Though it suffers from a lot of maladies common to micro-budget horror fare, it also has its own unusual charms. The plot of The Dead Next Door leans hard on Romero-esque zombie flick concepts: five years after a zombie epidemic, a government-sanctioned Zombie Squad struggles to find a solution to put the living dead down for good. Their best hope is finding a missing scientist and his formula so Dr. Moulsson (Bogdan Pecic) travels to Virginia with a squad that includes Raimi (Peter Ferry) and Kuller (Jolie Jackunas). They soon find themselves contending with a wild-eyed group of cultists led by Reverend Jones (Robert Kokai), who have found purpose in the zombie plague and want to keep it going. Like most micro-budget horror films, The Dead Next Door is stronger on ambition than it is on craft. The plot is more interested in setpieces than it is in internal logic, with a recurring problem being how characters frequently do dumb things to facilitate being bitten by a zombie. The filmmaking style is raw, veering between trick shots and more static setups, and the acting is hit-and-miss in classic no-budget filmmaking st yle. That said, it seems more fair to judge a backyard epic like The Dead Next Door on how often it delivers the goods in a way designed to please the party-hearty desires of the teenage horror crowd. 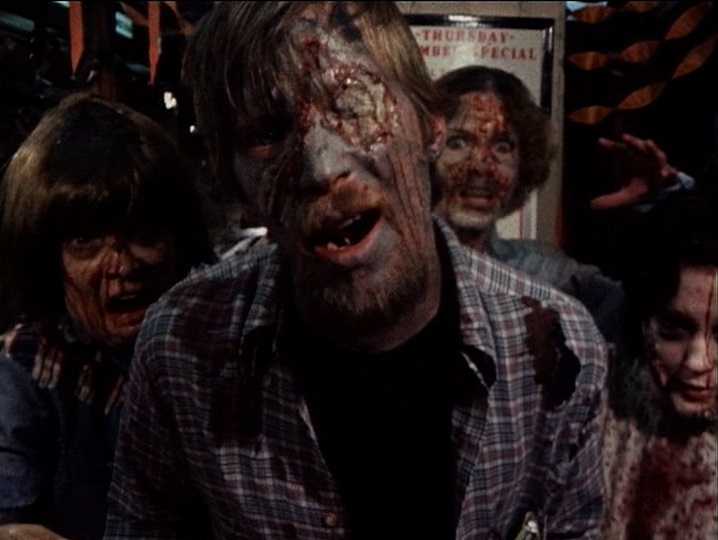 On that level, The Dead Next Door is a lot of fun: Bookwalter is aware of his shortcomings as a newbie filmmaker and puts his focus on tight pacing and delivering a steady stream of flesh-ripping mayhem. The lead performances are better than usual by micro-budget standards (Kokai in particular is legitimately good) and the film’s Dawn Of The Dead-derived comic book approach goes a long way towards making up for the logic lapses and technical stumbles. Sam Raimi fans will also want to check this film out because it has several direct ties to him and his stable of collaborators. Raimi was an uncredited executive producer and source of funding for this flick, taking the pseudonymous credit “The Master Cylinder,” and Bruce Campbell supervised the film’s original dub job, lending his voice to two characters and bringing in Ted Raimi and Dan Hicks to do additional voices. You also get Evil Dead II co-writer Scott Spiegel popping up early in the film as a jittery member of the Zombie Squad. Ultimately, the most important question a horror fan needs to ask with a film like The Dead Next Door is “Will I enjoy a film that is aimed directly at cravings for splatter and schlock that I loved as a teenager?” If the answer to that question is “yes” then you’ll find a buffet of splat that will feed the reptile brain desires of your inner 13 year-old.